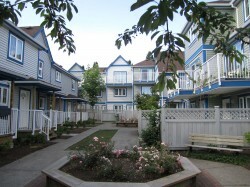 Chelsea Corner is located at 3548 Victoria Drive, at the corner of Victoria and Commercial Drive in Vancouver. It was built in 1990 by the West Coast Community Homes Society and was acquired by New Chelsea Society in 2010. Close to the heart of the Commercial Drive neighborhood and within walking distance of three parks in East Vancouver, Chelsea Corner is part of a lively and thriving mixed-use community. Nearby Trout Lake Community Center, Trout Lake Park and John Hendry Park. Laundry rooms and plumbing hookups for laundry machines available in townhouses.